We have just come back from a wonderful experience in Umbria, and it is all credit to the generosity and expertise of Alan and Susan Reed. This was our first course in Watercolour Painting. Hopefully, it will not be our last! The beautiful location, matched by exquisite accommodation, exceeded all expectations. Attended to by a dedicated, warm, friendly and attentive staff, we enjoyed THE most amazing local cuisine, matched only by the quality of the wine from the estate. Eduardo deserves a VERY special mention! Meeting in the evening for a pre-dinner Prosecco was always the prelude to a very special occasion. It was a diverse group of ‘artists’ coming together, a splendid mix of individuals generating interesting conversations, great laughter and immense warmth. The schedule was well-planned and executed. The well-composed itinerary opened our eyes to a variety of locations, all of which were stunning. Each time, the opportunity to sketch and/or paint gave the visit that necessary dimension, both for novices and budding impressionists alike! Alan and Susan know this area well, and were able to direct us toward good vantage points for sketching and painting (Alan), and great shopping finds (Susan). Their sensitivity to the needs and interests of individuals was always evident and appreciated….and that is a very special gift to have! Of all the many and varied holidays I’ve had this was one of the very best. So many aspects of it will stay with me: the beauty, tranquility, flora and fauna of the valley; the superb reverentially restored church and farmhouse; the attention to detail and comfort (who would have thought of building a fridge and glasses cupboard into an ancient wall surrounding the swimming pool? ); the wonderfully talented chefs and friendly staff; the lovely and unspoiled local towns and cities and, most importantly of all, the thought and care that goes into combining all of these into a perfectly balanced week with something for everyone and lots of choice. 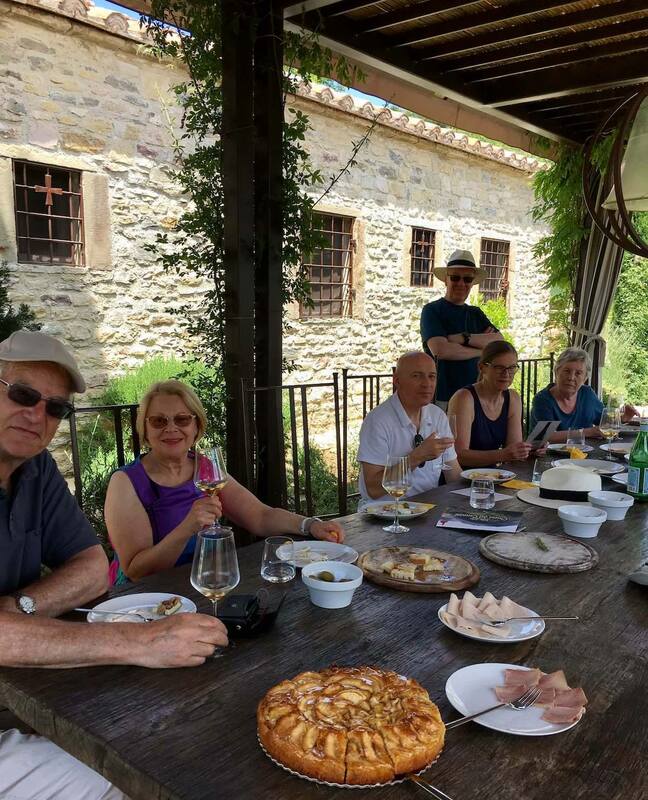 “We have just returned from our third amazing visit to Umbria with Alan and Susan Reed. They organise and manage a wonderful trip which provides fantastic art advice, support and development for those who are painting and plenty to do for those who are not. They are warm and caring hosts and friends. The venue at Chiese del Carmine is a sympathetically and beautifully restored church in a tranquil valley. The gardens and surrounding estate have beautiful walks. Susan and Alan arrange visits to stunning towns across Umbria which are great for artists and others.